I promise that Logan had fun. 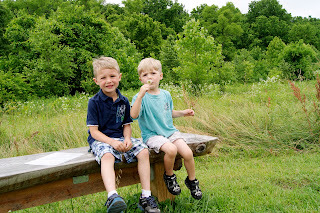 This week the boys and I visited a hidden gem in Chester County, Stroud Preserve. With more than nine miles of walking trails that range from easy to moderate it is a great place to get out and be one with nature. When Cameron was in preschool he was fortunate enough to have two AMAZING teachers. Coleen and Jodi have come up with some wonderful, science based programs for preschoolers and Kindergarteners. When Cameron was in their enrichment class we received directions for a hike at Stroud Preserve. We never got to take that hike with his class since it rained but I held on to the directions knowing that someday we would go. Now I get to share them with all of you. The boys were so excited for this adventure and they were really engaged with the conversation about all the great things at the preserve. We talked about the birds we saw and I showed them the birdhouses that are scattered throughout the preserve. They listened to the sounds the insects made and counted the butterflies. One of many rest breaks. With the directions, which you can print out for yourself HERE, there was also a list of things for us to look for. Whenever one of the boys would find something off the list they would get so excited. Cameron also loved holding on to the directions and being our tour guide. Of course it did get us lost…TWICE! We would highly recommend taking your family there for a stroll through nature. It was so nice to unplug for a while and hear nothing but the crunching of the ground beneath our feet, and the songs of nature (of course we heard the boy’s chattering on too). When we got to the top of the hill and took in the views of the beautiful Chester County countryside, even the boys stopped for a minute. I will warn you, little one’s will tire out quickly. Logan was sobbing that he was tired and wanted to go home for part of our journey. He was much better after a snack and a little rest though. At one point we were pretty deep in the woods and I wondered if we had taken a wrong turn (again). The pathway was barely wide enough for us to fit through single file, and I had visions of the Blair Witch Project dancing through my head. We did eventually make it out though. 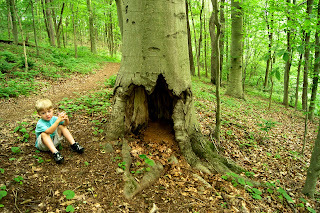 The hollow tree along the path. 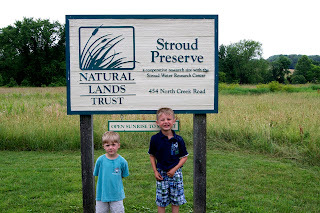 Want to visit Stroud Preserve with the kids? There’s an app for that. That’s right, you can use your Apple or Android device to take the SCVNGR Challenge. There are ten challenges to work through using signs, hands on activities and opportunities to reflect on their experience. Complete all ten challenges and get a free T-shirt. How cool is THAT?!? The app is a great way to get our tech savvy kids out and interested in what nature has to offer. I only wish I had known about the app before we went. Oh well, it’s an excuse to go back again. The down side? Stroud Preserve would be a wonderful place to have a picnic, but unfortunately they don’t allow it. 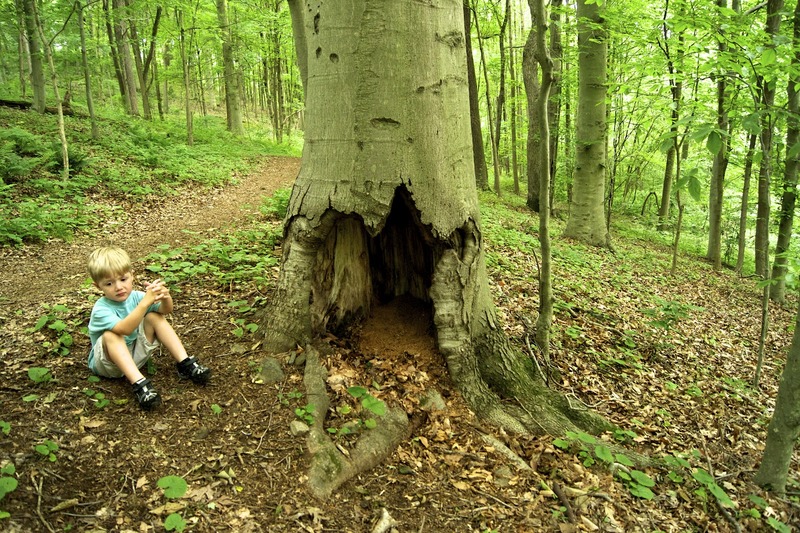 Stroud Preserve and the Natural Land Trust want their visitors to follow the Leave No Trace Principles when visiting. 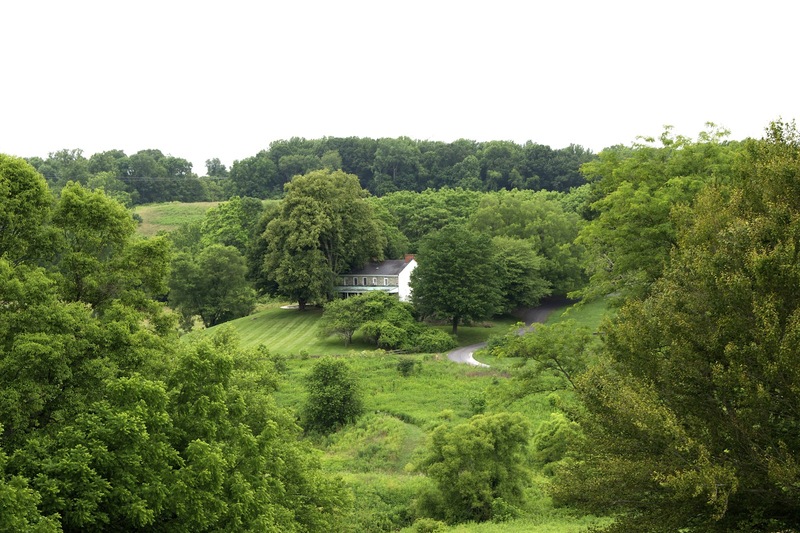 I can respect that, Stroud Preserve is too beautiful of a place to spoil. Check out what Stroud Preserve has to offer, it’s good, FREE fun!